The history of modern email usage and services dates back to the early Internet which grew out of ARPNET, a network sponsored by a U.S. Department of Defense research agency in the 1960s that is accredited with providing the foundation for the worldwide Internet of today. The number of e-mail users worldwide has since grown to more than 3.8 billion users and is projected to reach 4.3 billion by the year 2022. In a 2016 survey on American e-mail user behavior, 63 percent of respondents claimed to have only one e-mail address, 19 percent said that they check their email a few times a day, and a laptop or desktop computer was reported to be the access device most often used to check for email. In another survey on reasons for consumers e-mail usage in the United States, 51 percent of respondents were reported to have used their email for buying things online and 81 percent of consumers answered that they checked their e-mail randomly throughout the day. There are different kinds of email providers available in the United States, either provided for free or paid for, anonymous or requiring full identification for registration. As of 2016, Google was by far the number one primary e-mail provider through its Gmail services according to consumers. Other popular e-mail providers available in the United States include: Yahoo, Outlook (Hotmail), AOL, iCloud and Comcast. E-mail marketing is also on the rise in the United States. As of May 2017, the a significant share of U.S. consumers received newsletters delivered to their private e-mail accounts, with 33 percent of consumers receiving up to 5 newsletters. The leading source of e-mail newsletter subscription according to American consumers was from brands or manufacturers, closely followed by retailers. About 65 percent of American consumers have a preference of receiving information about special offers and discounts in their newsletter. This is one of the top reasons for subscribing to e-mail newsletters according to consumers in the United States as of May 2017. In 2016, around 2.57 billion U.S. dollars in advertising expenditure was generated through e-mails. 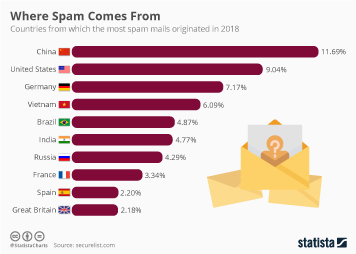 China and the United States are the leading countries of origin for unsolicited spam e-mails by share of worldwide spam volume. As of the second quarter 2018, Germany, Russia and the UK were ranked first for antivirus activations worldwide. In 2017, e-mail spam accounted for 55 percent of all e-mail messages globally. In the United States, email privacy is protected under the Fourth Amendment to the United States Constitution which guarantees privacy rights against certain arbitrary and invasive acts of the government. The United States Constitution does not protect the privacy interest of private-sector employees.